It has always been a stressful factor for all the job questers in order to obtain a job in the job market. A job for everyone is an important aspect which develops prestige and better financial security. George Dutch, who is an experienced career expert mentions that job questers should determine the strategy first whether it’s short term or long term. He also mentions that there are a number of bad factors which has pushed job seekers into trouble. The main intention for any employee should be to get associated with the organisation which matches your skills, personality, education and other factors. Let’s sail through a few job hunting strategies, either its short-term or long-term. When you take a deep look at the job market, employers hunt for prospective employees and they avert negative or desperate employees. For the same reason, job questers are supposed to be outwardly positive. Candidates who are confident and also specific regarding their jobs are the ones who are picked immediately. Get out of the bubble whether it’s a bad state, irritation, frustration or more and create a positive mentality by doing something you like. This idea would be a perfect short term strategy for people who need a work. Job searchers here can start a freelancing practice, become a contract worker or also initiate a consulting firm. This idea works and helps jobless candidates to get re-employed. Take up few assignments and complete them successfully which can be added to the resume to highlight it. By this way more satisfied customers and client referrals can be obtained. You develop your own office by hiring your friend’s room and donate your service. Maintain your own office and work as an employee by taking up new tasks. This is another short term strategy which can be followed as a job search strategy. If you possess experience in a particular field, you can start consulting for a minimal fee. By this way the void in your curriculum vitae is filled and you get a chance to discourse something in the interview. This short term strategy shows that your service is mandatory for others too. When designing career plan, it should be in a manner where you take a number of small steps rather than a big leap. 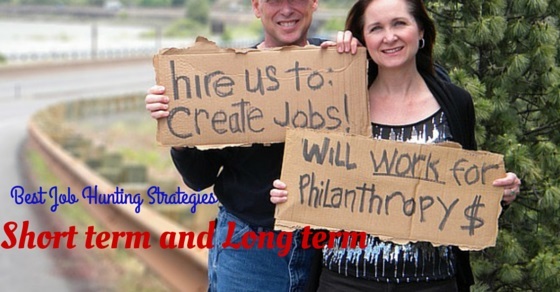 A short term strategy can be to take up short term assignments to put an end to long term joblessness. It would be advisable for job questers catch up short term opportunities to catch hold of a long term job. To get to the right destination, one needs to pass many phases in the right order. Getting yourself trained in new skills and also acquiring a certificate for the course is another short term strategy for job search. The certificate is a proof which mentions that the candidate meets the required standards. By this way registered apprenticeship trainings are also available. It is always a mistake where job seekers try to get themselves into one compartment and forget that there are a number of other roles and jobs. It is suggested that job seekers should take up an aptitude test and pass the entry gateway for a variety of jobs. They are unaware that they have the skills and capabilities to get into other industries and various roles too. Another short term strategy for a job hunt is to keep educating yourself. Certain employers think that lack of ambition is something that prevails in job questers, for the same reason getting enrolled for any related degree or pursuing classes can enhance their knowledge. A short term job hunt idea would be to look for the various job categories instead of waiting for one job. A company recruits and has multiple openings such as part-time jobs, contract jobs and more. Present your experience as a tool that solves the employers puzzles in the organization. Speak about your ability and what you can accomplish in the company rather than speaking your past which is already mentioned in the resume. Setting up goals for your career can be short term or long term objectives. Job hunt should be categorized whether it’s for short term or long term. There would be a number of questions in the interview such as your degree and what it can fetch you, your skills, your interest, your expectation, salary, and more. When you looking for long term career, it would be mandatory to develop core skills which employers look out for. Job quester may have set goals, whether its long term, short term or intermediate. Once done, its time to execute the goals. You can work towards a long term goal which may be a job for the next five years. You may also love to get a short term goal which later leads to a permanent job. Your job search can be minimized by following an effective search plan. Make sure you schedule time for short term as well as long term goals. Try to get a detailed list of companies which you desire to work for. Remember to have contacts list, and details regarding interviews, conversations and more. Try to track network with computer database and other sources. By this way people’s names and conversations can be recalled. Either you’re in a short term or long term job hunt, make sure you incorporate them with your overall job search plan. There are a number of job search methods where the primary one can be to visit career development and employment services. A career counseling office is a place where number of resources are available. Tips related to interview and resume can be obtained from them. They offer information on industries and companies and also help a lot in job search plans. Apart from all these networking and job opportunities can also be obtained from them. Job Questers can also accept volunteering and internal campaign jobs initially. The key advantage for getting into such job is that you can get to know more employees and you can also get to know more chances about positions inside the organization before they are advertised. Other methods would be through newspaper and magazine ads, cold calls, browsing the net, mass mailing and through recruitment agencies. Irrespective of your job hunt, whether long term or short term, make sure you keep yourself organized for the job hunt. Look out for a job seriously by planning and following the same. Pen down a schedule with a time span for each and every task. Whether its phone calls, reading papers or browsing for jobs, set aside time for each task. All jobs aren’t advertised where nearly 80% of them are filled without publicizing. The way all these positions are filled is through referrals, trusted associates, recommendation from employees, direct contacts or through recruiters. Do what is the key to the hidden job market? It is just networking where you can utilize your contacts and get linked with the employers contact. Employers are monitoring and are hunting for efficient employees as they require to replace inefficient, retiring and parting employees. Job seekers can utilize this opportunity and get entry into the industry by making use of networking. Regardless of the job, whether its short term or long term, networking is one main source which can help you gain a job. You will not know where the jobs are prevailing and recruitment takes place. This can be well accomplished by networking. It is good to develop a list of networks with people whom you know and remember not to restrict the list. Researching companies is an important job search tools. By doing so, one can get to know something about the organization and also obtain a contact. The other advantage of researching a company is that you can get to know the expectation of the company and match your skills with it or also enhancing skills. You look better in an interview when you have researched and gained knowledge. Job information and help is required for a job, whether short term or long term job. For the same purpose, the internet can be the primary resource which offers complete information. The other sources are the employment offices and apprenticeship and training centers that are present within the state. In the same manner private employment services can also be targeted in order to get a job opportunity. A resume is a tool which takes you nearer to the job recruitment. This selling tool should be drafted effectively and make you stand out of the rest. Follow guidelines for resume writing or seek the help of a professional to draft a faultless resume. If you desire to land up a job quickly within a short time span, the above tips would be beneficial. All these strategies can be utilised to achieve goals for your career. With the time frame for both short term and long term job hunting, quality time should be dedicated to developing plans for the job hunt. Job hunting can be refueled by following the right tips and getting to the destination.